Numark launched their NuVJ VJ product, a combination of a DJ-style MIDI controller with software from Arkaos, back at Musikmesse in April. The hardware is now nearing release, and it’s priced at only US$300. The gear is aimed at DJs, but it may appeal to anyone who wants a hardware controller well-suited to live electronic music and VJing. With driver support for both Mac and Windows and full MIDI support, it has the compatibility apparently lacking in Behringer’s BCD-2000, as reviewed here on CDM. 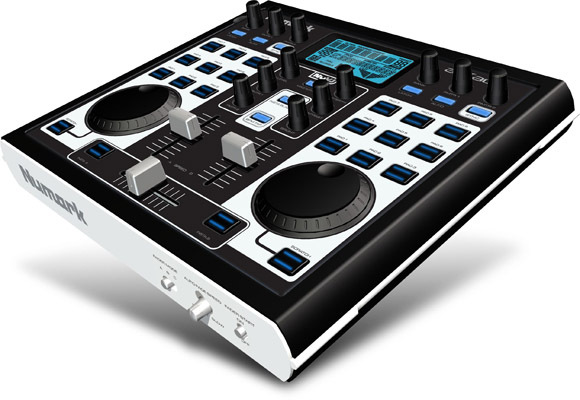 The control surface itself looks terrific: two banks of 9 trigger pads each (for a total of 18) for triggering clips, big, solid-looking DJ mixer-style faders, knobs (which appear to be endless encoders) that should be useful for effects, and most importantly, two large wheels for scratching, speed control, or other effects. 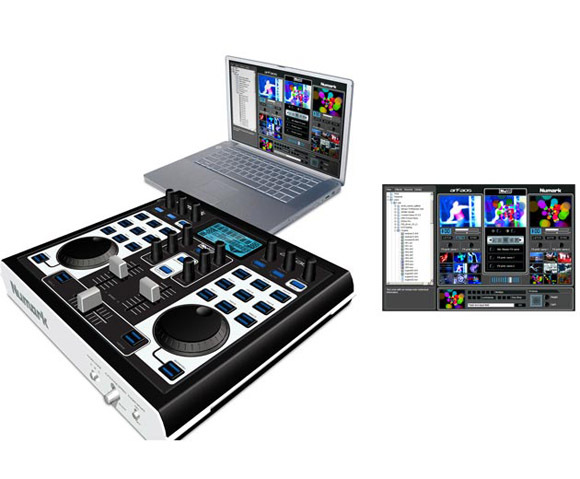 The software side is a Numark-branded version of ArKaos VJ, the tried-and-true VJ software for Mac and Windows. No word yet on if or how this might differ from the full release, but there are a number of reasons why ArKaos may be a good choice on Numark’s part. Unlike motion dive .tokyo, the software bundled with Edirol’s competing hardware/software combination, recent versions of ArKaos support graphics card GPU acceleration, which is essentially for getting higher resolutions and framerates. ArKaos isn’t the only software to do this (Livid Union is one example), but it is to me an essential feature. ArKaos has gotten a bad rap among some VJs because it’s been used for a lot of really cheezy effects over the years, but if that were the standard, I don’t think we could talk about any software. With full support for FreeFrame effects (the open source effects standard) and Core Image plug-ins, this could be a strong VJ software choice, and US$300 is a new low in cost for software/hardware bundles. Good news for Intel Mac users: this app is already Universal. Of course, there’s nothing saying you have to use ArKaos; this is still a competitively-priced controller even if you throw away the software and just use MIDI to control something else. You might be confused by Numark’s product site; many of the features mentioned (camera input, BPM sync, effects) are in fact features of the ArKaos software, not the hardware itself. The NuVJ hardware is just a MIDI interface; there’s no onboard video processing of any kind. But no complaints here: the price is right, and this hardware could be a fantastic controller for both music and visuals alike. I hope to test this hardware so we can see if it lives up to its claims; stay tuned. Here’s a closer look; click through for the full-sized shot.